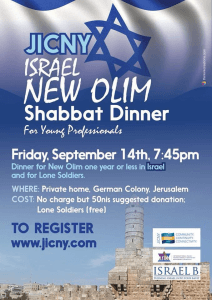 The Jerusalem New Olim Shabbat dinner on Friday, September 14th welcomed olim chadishim who have been in Israel in one year or less. Over 45 young Internationals from a number of continents and countries including Australia, UK, Mexico, USA, Zimbabwe and more, joined us for a warm and entertaining Shabbat dinner at the home of Jodi & Gavin Samuels. 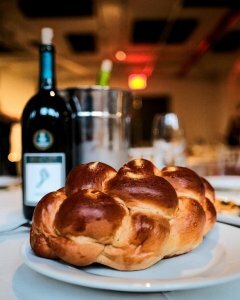 During the dinner the olim shared their trials and tribulations about the first year of Aliyah, and then mingled and socialized at the grand buffet dessert. A great time was enjoyed by all!